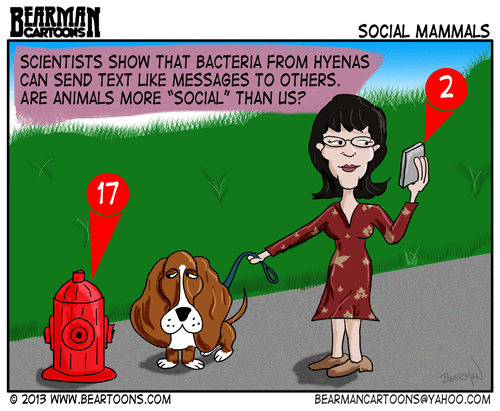 The question is does this form of primitive (or advanced) social media among hyenas also carry over into other animal species (including Basset Hounds like Mary owns). And you thought your dog just liked to smell other dogs butts. Ha Ha!!! Love the dog at the hydrant Bearman, his expression is a classic. This truly is a site of higher education & should be mandatory reading in schoos. We know animals mark their territories and that can be sniffed/read by other animals. So they certainly communicate on some level. And many use vocalizations and body language as well. Maybe we’re just de-evolved dolphins. That is what I am thinking. Maybe our evolved brains lessened our evolved noses. I think they are just smarter than us! And yes, a fire hydrant definitely gets more social interaction than I do. I think that dog is way smarter than we are. After all who picks up their poop? Us. It’s not the other way around. No but if you leave it around long enough, the dog might just eat it. Hyenas are really advanced mammals in terms of intelligence and communication (having a diverse language that includes the famous “Curly whooping” sound). This is yet another outlet of the hyena social network. You did a great job on that dog, B. I keep staring him in his eye. Not the brown one, thankfully. WE can always turn it around for you. Well, there’s not another animal that’s going to LOL better than a hyena! Love the dog’s face, Bearman! Thanks Mark…you know how much I hate to draw animals. Nice. Real animals don’t need electronics. Who you calling an animal? My phone is covered in bacteria and I mash them when tweet. Does that count? Aren’t those both good things? You have 17 new messages, one direct urination. I learned that ants are very social but I wouldn’t want to be one. Look out a shoe!! When we walk our dog, Coco, she will sniff around a squirt a little bit of pee here and there. Once she ran way out of her way to pee on a stick in the middle of the road. It was funny. I guess that was the day’s meme for them! She wanted you to know that she owned the block. I guess it’s possible to get TMI when they do the sniff test! Would that be TMP (Too much poop)? They are probably very well aware when Windex from my bathroom is about to make an appearance. yes…thanks me too. I’ll be doing something for him soon. I gotta say, hyenas are way ahead when it comes to technology than us humans! Too much learning! It’s making me feel sick! So sad to hear about Bo. I know you were very close to him Bearman. Rest in Peace. I can only hope hyenas can keep us up to date on what they’re having for dinner too. Those are the most important posts of all.